Within the lavish rooms of the Silver Twilight Lodge, the most influential citizens of Arkham gather to forge business alliances, plan parades, and lobby politicians. In secret, they also meet to complete forbidden rituals with uncertain consequences. The poor souls that discover this truth often vanish, never to be heard from again. 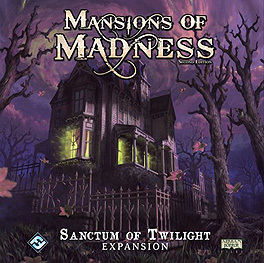 The Sanctum of Twilight expansion introduces the machinations of the Silver Twilight Lodge in two new scenarios. In one scenario, the investigators must reveal the sinister plot behind an annual parade thrown by the illustrious order. In the other, the investigators must discover a way to escape the Lodge itself and lead their fellow captives to safety. This expansion also adds new investigators, new spells, and new items to assist in these investigations, as well as a new, incorporeal threat, the wraith.